What is the best pet memorial garden stone? Where can I get engraved pet memorial stones? Where to buy personalized pet memorial stones? 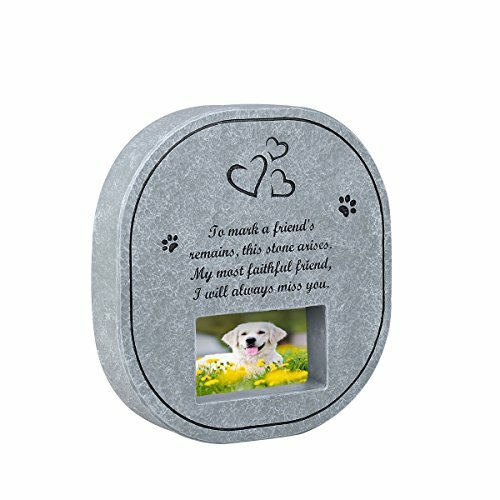 Best custom engraved pet memorial stones? Saying goodbye to a beloved family pet is incredibly difficult, regardless of what type of animal we have been privileged enough to share our homes with. Pets are simple beings; they know how to appreciate the moment, show affection when affection is due, they don’t judge (okay, cats can be a little judgmental, but hey, we love them anyway) and they provide us with the company when we need it the most. Some say you haven’t really “loved” until you have loved a pet, and perhaps it is true? Despite how much we love them, however, pets don’t usually live anywhere near as long as us humans do, which means we eventually must watch them go. We have to say goodbye. A beautiful way to honor a deceased pet is with personalized pet memorial stones, that can be placed in outdoors, indoors or directly over the final resting place of a much-loved animal friend. 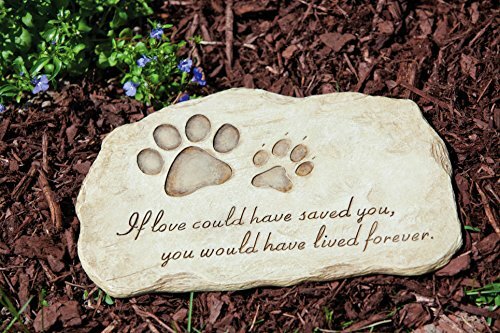 This simple yet beautiful memorial stone for dogs and other pawed animals has a touching quote engraved, which reads “If love could have saved you, you would have lived forever.” In many pet-owning households, this couldn’t be more accurate. These pet memorial stepping garden memorials are made from actual stone, and they are treated with a special finish which protects them from the weather conditions such as the sun and rain. Why We Liked It – There is something so simple and perfect about this pet memorial stone, and the quote accurately reflects how most pet parents feel after losing their dog, cat or another animal. 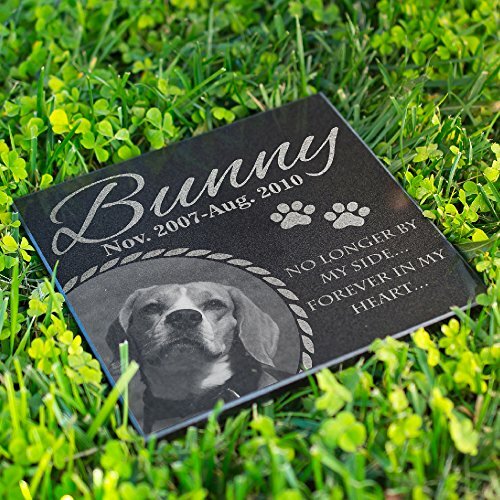 Made with lightweight and waterproof polyresin – these engraved pet memorial stones are worthy of a place in your backyard or inside your home, as a way to honor that furry family member who is no longer with you. This Izery Engraved Memorial Small Heart memorial stone features a touching engraved image of a hand holding onto a paw, and a quote that goes straight to the heart. Show your dog, your cat or whatever pet you lost how much he or she meant to you, even when they are no longer physically present. Why We Liked It – The way this pet- and dog memorial stone is shaped says so much about what he or she meant as a family member, and the text won’t wash off even in rain or snowy weather conditions. 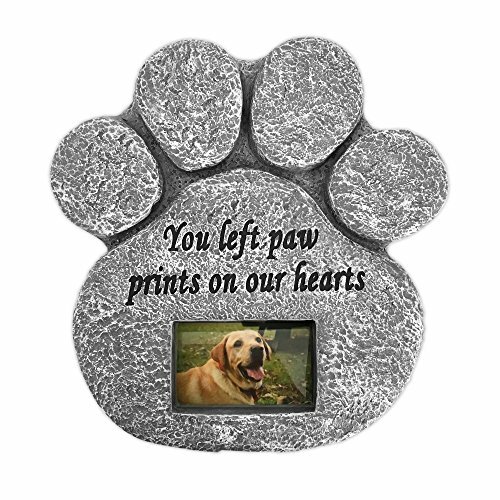 Consider these pet memorial stones personalized with a photo of your late friend and get a wonderful reminder of that furry (or not so furry) buddy who is looking down at you from above. The material feels like real stone, and it can stand up on a shelf inside the house or lie flat in the backyard or garden. It is waterproof and won’t be destroyed by rain or snow, and it comes in a well-crafted gift box in case you decide to give it away as a present to someone. Why We Liked It – For some dog lovers, a more personal pet stone memorial might be preferred. This product allows you to slip in your pet’s best photo so that you can be reminded of their beautiful smile or alert eyes every time you look at it. 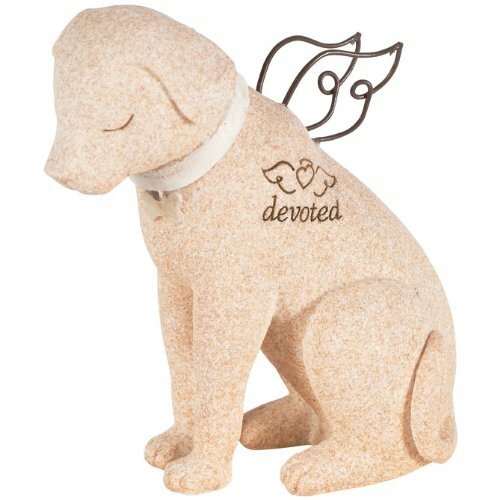 The durable resin used in this product is made to resemble sandstone, which gives this memorial stone for pets an authentic look – almost as if you would have carved it out yourself! Every family member deserves to be remembered forever, and this is a nice way to also include them in family life even after they are gone. It has a small hole on the back for easy hanging and can be kept outside as well, regardless of the weather. Why We Liked It – Pet memorial stones are incredibly personal and purchasing one is an important step after the loss of a pet. 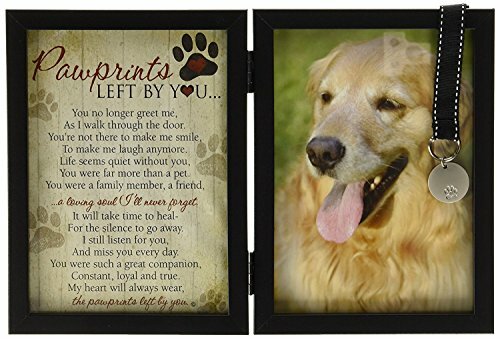 This product can be hung on the wall inside or kept in the garden so that you can choose what you feel will best honor your old friend. 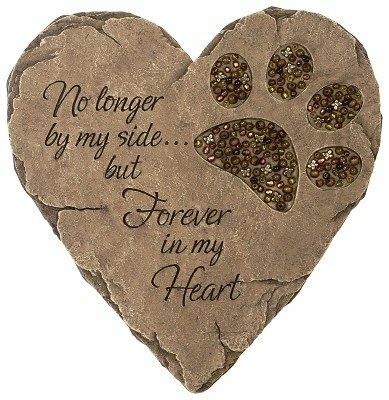 Let one of these pet memorial garden stones be the symbol of your fur baby having gained wings and use it as a nice reminder of all the good times you had together. 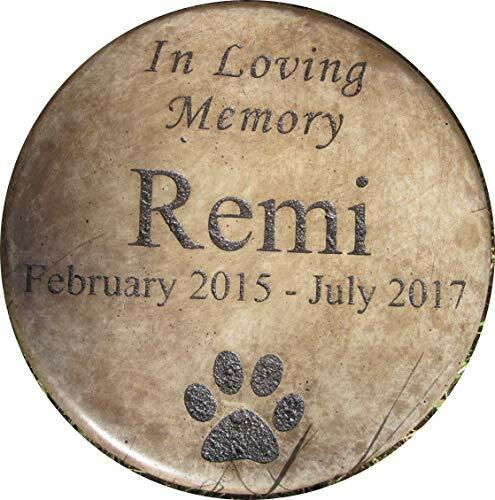 It is a memorial pet stone made with cement resin, this Halo Remembrance Stepping Stone Plaque has a hole for hanging and can be used both indoors and outdoors. The “Run free now, go play with the angels” message on this pet memorial plaque is very fitting, considering that’s probably exactly where a good-hearted pet goes when he or she passes away. Why We Liked It – Memorial pet stones allow our pets to stay with us even when they are gone, and this one is perfect for departed dogs, since this pet memorial plaque has an angel dog as its main feature. This unique and partially hand-crafted memorial stone for dog owners who have lost a pooch is truly one of a kind. It is made of actual crushed stone and carefully bound together with resin, to make sure the statue lasts for as long as you need it to. Each individual piece is hand-painted by one of the company’s artists, and the artist also adds the final touches before shipping it off to expectant dog parents. There is a care for detail so meticulous that you can see how important their work is to them, and how well they understand the pain that comes with losing a dog. Can be used both indoors and outdoors. Why We Liked It – The careful craft that goes into each one of these memorial stones for dogs is impressive, and just what you should want to honor your four-legged friend with. Memorial stones for pets need to be able to withstand the outdoor elements, and this product here is made with waterproof resin – which resembles real stone – and it allows you to insert a photo of your best fur friend through a slot at the base, so that you will always have him or her there with you, even if they can no longer be present physically. It is recommended that you laminate the photo when using these memorial rocks for pets, to avoid humidity and moist to ruing it on rainy and wet days. The stone itself is perfectly waterproof and will not be damaged. Why We Liked It – Having your pet’s picture on the personalized dog memorial stone you choose is priceless, as it makes it so much more unique. This product looks and feels like real stone, and it can resist the outdoor elements if that is where you wish to place it. These custom engraved pet memorial stones are truly unique as they are made specifically for your pet, with his or her name, birthdate, and date of departure engraved. You fill out these details when ordering, only to receive the most precious pet memorial stepping stone at the time of delivery. 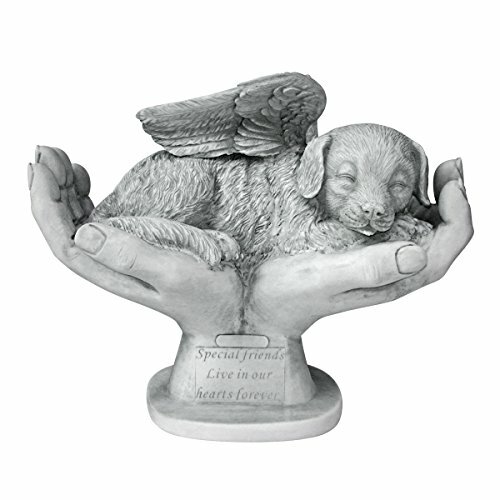 This rainbow bridge pet memorial is made with durable cast type concrete, and since each is individually manufactured – they get their own touch and uniqueness. It can be placed on a shelf inside the house, or gently pressed into the sand in the backyard. Why We Liked It – While most engraved stones for pets come pre-engraved with a phrase or a quote, this rainbow bridge pet memorial is 100% personalized with your pet’s name, birthdates and the date they flew off and over the rainbow bridge. Do you want to have your pet stones engraved and customized according to your own personal preferences? Then this is the product for you! You can choose what text to add to the stone; for example, the name of your beloved pet, birth year and the year they left, or you can pick a quote or a few well-chosen words. The company behind these Stone Dog Pet Grave Markers and remembrance stones for pets is very open to meeting your needs, and you can contact them with wishes, requests and any preferences that you may have. It is a classy looking pet gravestone that will remind you of your friend for as long as you wish to be reminded. Why We Liked It – When purchasing one of these pet markers, you can choose more than just what goes on the stone! You can customize size and overall look of the grave markers, to have it look exactly the way you want it to look. Get personalized pet memorial garden stones with your pet’s name engraved! These are made with real stones, which sets them apart from many other products, and you fill out the name you want to be engraved when ordering. There is something irresistible about a real rock to place in the garden – there is nothing quite like it – and the paint used for the engraving is waterproof and will continue to look good even after being exposed to rain and snow. The stones are made by an American company in the United States. Why We Liked It – Not only are these animal memorial stones customized with your pet’s name, but they are also made with real red stones, which makes the pet garden stone feel so much more authentic. 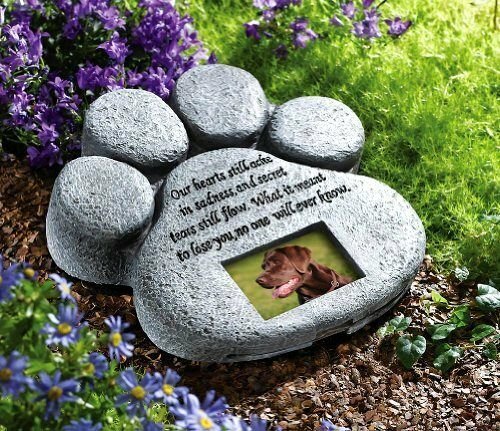 This touching indoor- and outdoor custom pet memorial stone is one that you can adapt by adding your departed pet’s photo. 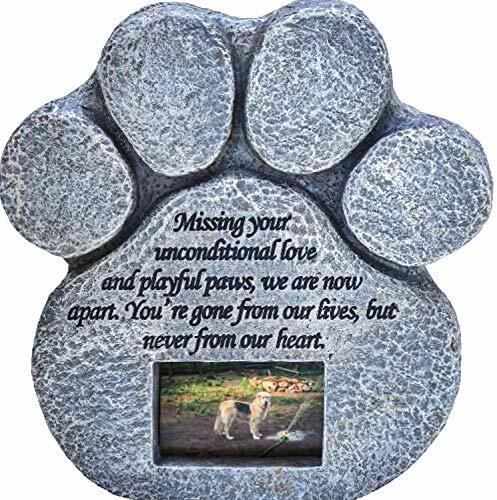 The CTD Paw Print Pet Grave Memorial Stone makes it a lot more personal to be able to look at it and see your much-missed furry family member look back at you, and this product also comes with a quote! 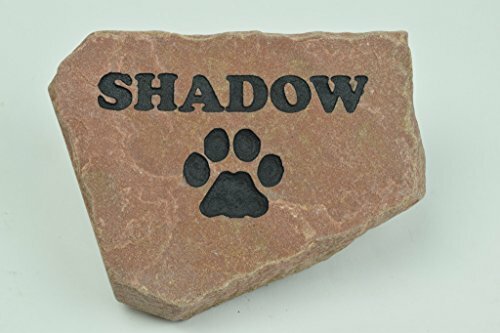 While shaped like a pawprint, these cat- and dog remembrance stones both look and feel like real stone, and they will look amazing in your backyard or inside in a carefully chosen spot. Missing a cat or dog that has passed away is unavoidable, and this is a wonderful way to honor and remember those pets that are gone. Why We Liked It – Pet memorial stones are so important to many owners of a deceased pet, and this product shows your departed family member the respect he or she deserves, with a sturdy and durable stone replica that offers the opportunity to add a photo. Made with waterproof resin and with a transparent acrylic protection board surrounding the photo slot – this is a memory stone for pets that it designed to last. Add your favorite photo of your dog, cat or other pet and have that remind you of the good times and of the love shared. This UEETEK Tombstone is simple and classy in its appearance, making it perfect to put on display in the living room or perhaps as a front yard decoration. This UEETEK Tombstone looks just like a real rock, which means it can easily blend in with whatever else you have in your yard and become that subtle yet heartfelt tribute your fur baby deserves. Why We Liked It – The little gift box has been designed to respectfully honor a departed friend, which makes these memorial stones for dogs and other animals a great present to give to someone who has lost a fur friend. These lovely pet headstones are made with thin Granite and Marble, they are lightweight and durable, and can be used as a decoration inside, in the garden or to mark out your four-legged friend’s final resting spot. The granite pet headstones come in a variety of styles and will have your pet’s name, birth year and year of departure engraved. 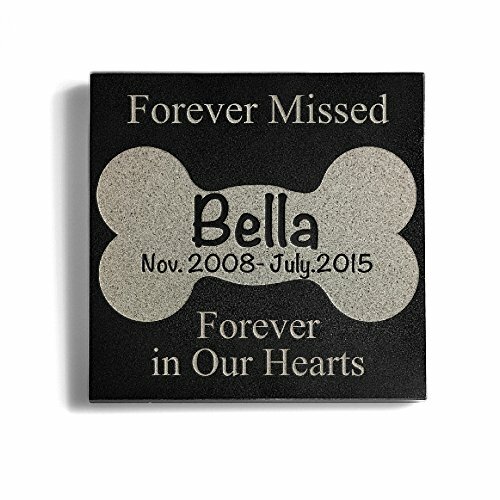 Being able to choose size makes it possible to pick one that will fit perfectly in the space you have intended for it to be placed, and this engraved granite headstone caters to every dog lover’s needs and requirements. You can always contact the company if you would like a different type of engraving, as they are very dedicated to meeting their customer’s expectations. Why We Liked It – These marble and granite pet headstones are some of the few pet stones we have found that are made with this type of a quality material, without it affecting the cost negatively. Incredibly sophisticated design and a personalized memorial engraving – hard not to love! Losing a dog is difficult for everyone in the family, as dogs tend to become almost like another child or like a furry brother or sister. 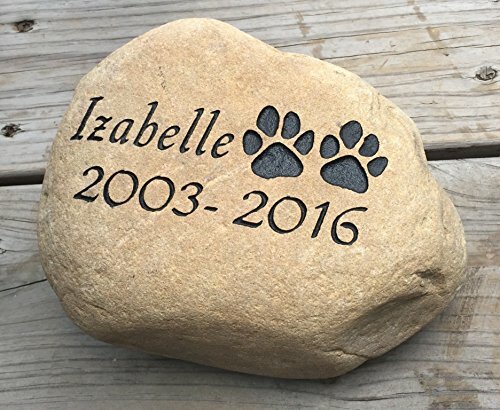 With these stone pet memorials garden stones, you get a chance to customize the text on your stone, as well as choose from several different designs, to make sure it lives up to the expectations of everyone who loved a dog that has now gone over the rainbow bridge. Having something like this will not make the pet loss any easier, but it will give your family a chance to remember and to handle your grief together in a healthy way. Why We Liked It – The subtle engravings and designs you can choose from for these memorial stones for dogs are beautiful, and it is a wonderful way to show everyone what your dog meant to you. This product here is one of a kind! The manufacturer produces gorgeous and personalized dog memorial stones engraved with name, dates and even a photo. While many other similar pet supplies have a slot for a photo of your pup (or another animal), this dog garden stone has the photo carefully engraved in the Granite stone material, making it a lot more durable even for outdoor use. Place it as a headstone on a pet grave, keep it somewhere in the garden (perhaps under that tree where your dog liked to rest?) or on a shelf inside! Regardless of where you put it – these pet memory stones are sure to catch everyone’s eye while also providing comfort. Why We Liked It – When considering purchasing pet monuments stones are often used as a base. Many products, therefore, look alike, but this granite pet memorial here is something completely different! Yes, it is more expensive than many others, but this granite pet memorial is also one of few that allows you to have your pet’s photo engraved in the material, which takes the idea of pet garden stones to a whole new level. A wonderful way to pay tribute to your departed pet! These pet and dog memorials for garden and indoors are made with real natural river stone, and not with resin like many other products. Each stone is different since they come straight from nature, which gives them a unique touch to complement the personalized engraving. Have your pet’s name engraved, along with the year of birth and year of departure and see how it lights up your back- or front yard. Be reminded of your best friend every time you go in or out, and let it help you process the pet loss. Why We Liked It – Sometimes it feels nice to just go back to the basics, and with this all-natural option – a real river rock – your pet and dog memorial stones will stand up to any weather conditions while providing you with comfort after losing your best fur friend. Consider placing one of these adorable and hand-painted Resin figurines next to your dog memory stones; especially if planning to keep them indoors (since they are somewhat small and easy to lose outside in the grass). Give your faithful friend its own shelf somewhere in the house and let this be the perfect complimentary item. 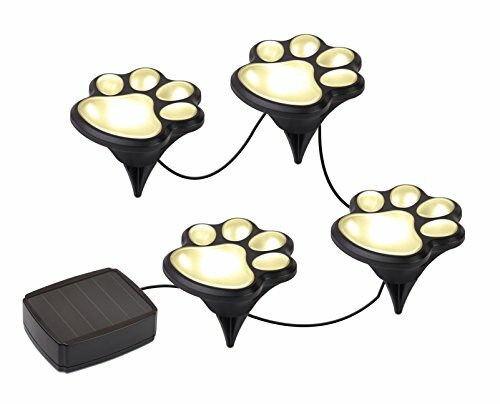 These easily installed garden lights are shaped like pawprints and can be used to light up the area where you choose to locate your pet stones memorial spot. When we have to say goodbye to our pets memorial stones can provide some comfort, and what better way to honor your pet than to light up the stone with these adorable lights? You can place them in a circle around the memorial stone, or somewhere close to it so that it can be seen even when it is dark. This Paw prints Memorial Pet Tag Frame is the cherry on top for a respectful and dignified memorial for your beloved pet! 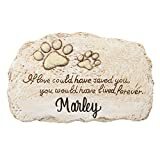 Place it on a shelf together with an engraved memorial stone and perhaps also the pet figurine mentioned above and let your fur baby be a part of the family even when he or she is gone. This Paw prints Memorial Pet Tag Frame is a beautiful black picture frame with a comforting poem, and it comes with a tag that can be engraved with your dog’s name or switched with his or her actual tag. Purchasing a pet memorial stone is something many people prefer not to think about, because when that time comes – it means that a beloved family member will no longer be there to greet you at the door when you come home after work. Losing a pet is incredibly difficult, but it is something that every pet parent will have to deal with sooner or later. Storing away our grief by trying not to think about the pet we lost won’t do us any good, and it is a lot healthier to process those feelings in a good way. While these types of products are almost always referred to as “stones,” they aren’t always made of actual stone. A resin is a commonly used material, which is very resistant and great for outdoor use, and it tends to look like a stone even though it really isn’t. This is a personal preference, and if you prefer real stone – make sure you read the product description to find a memorial stone that is actually stone, and not Resin. A real stone product will specify this, and it can be made from a regular stone, reddish River rock or any other type of stone, with either engraved or painted details. For those who prefer something a little different; look around for Granite products, which often tend to look a little extra fancy – almost like Marble – and which is also a durable material that can handle the outdoor weather. Some will only have the pet’s name engraved, others will also come with birth date and date of departure, and some will even have your pet’s photo carved into it! Products featuring only an engraved name are usually the cheapest ones but considering how much time you probably spent with your furry friend – it is understandable that one might want to invest a little in that final act to honor him or her. Get your dog and cat memorial stones personalized with name, dates and/or a photo, so that you can look down and smile at the memories of a friend who was there for you when you needed it. Before deciding on what product to get, you will want to consider where you plan to place it. While most are suitable for both indoor and outdoor use, it is not a guarantee, so if you plan to keep it in the garden you will want to establish that it won’t get ruined if exposed to rain, snow or other outer elements. Real stone will obviously do well outdoors, but it is also important to consider the engravings and any paint used, to make sure that is also waterproof and weather condition safe. Save yourself the trouble of having your dog or cat memorial stone ruined by reading the product description properly before deciding to make a purchase. Naming the best product is difficult since it depends on what you feel is right for your family, and what is the best way to honor your much-missed friend. The ‘Evergreen Garden Pet Paw Print Devotion Painted Polystone Stepping Stone’ is an excellent option due to being made with actual stone, which means that each piece is entirely unique (no two stones look alike). It also has a protective finish covering the quote and the engravings, so that you don’t have to worry about sun-, rain- or weather damage. It is a simple yet effective way to give your dog, cat or other pet a forever place in your family home. When a pet dies, the last thing you might want to do is to go out and see people, even if just to purchase a memory stone. With that in mind, why not consider an online purchase? Amazon lists countless options, which will be conveniently shipped straight to your door. We have tried to gather some of the best options available on Amazon, to make the process easier for you in this time of sadness and grief. 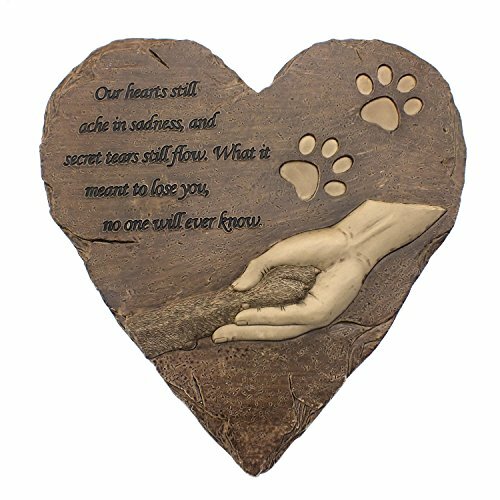 A great product to consider is the ‘Izery Engraved Memorial Small Heart memorial stone’ where the engraving of a human hand gently holding a paw – offering a touching demonstration of the bond between you and your dog, cat or another animal. Once again, Amazon is an excellent option thanks to the wide selection offered, and the ease with which you can do it all from the comfort of your home. Engraved memorial stones are fantastic ways of remembering a deceased pet, but perhaps you want to take it one step further and invest in a personalized item with for example name and dates? 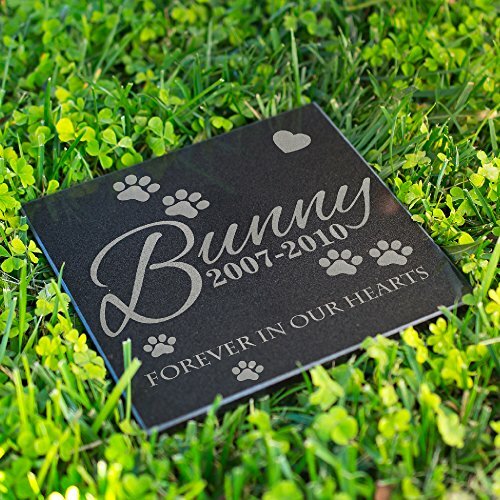 Have a look at the ‘Personalized Engraved Pet Memorial Step Stone’ which gives you the best of both. It features a respectful and comforting quote, and as an extra plus you can have it personalized with the name of your pet, his birth date and that date you won’t ever forget – the day he or she headed over the rainbow bridge. When purchasing these through Amazon, you can easily compare prices, and pick the option that is best for you. While many products on the market are quite similar, it is not hard to see why the ‘Personalized Dog Memorial with Photo’ stands out. Not only does it feature the option to add a pet name and dates to it, but you can also have your beloved dog or cat (or other pet) engraved on the stone by providing a photo. The manufacturer has taken the photo option a step further, and while many similar dogs or cat memorial stones feature a slot where a photo can be inserted – these guys engrave it straight onto the Granite rock! It looks sleek, classy and dignified – just how you might want to remember your best friend, and it can be used both indoors and outdoors. 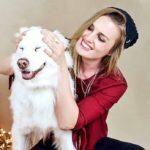 The death of a pet is unavoidable, as most don’t live lives as long as human lives, and that is something we will, unfortunately, need to learn to be okay with. Instead of letting a pet’s death break you; try to be grateful for the time you got to spend together, for all the memories you made and for the unconditional love that was provided, and when the time comes – find a way to honor your friend even when they are no longer physically there. A memorial dog stone might seem like a small thing to some, but it is a way to move on while also keeping that departed pet close, and to let that special bond remain unbreakable. Choose wisely when picking out a customized pet memorial stone, as you will want it to last for as long as possible. Allow for the selection process to take its time. It is an important decision, so look around at the different options available, compare, and ultimately choose the one that feels right for you. Some claim that dogs and other animals live for such a short time because they already know how to live their lives to the fullest. They live in the present, love unconditionally, feel happy about the smallest of things and they don’t hold a grudge, which means they complete their cycle of life a lot faster than a human, who has so much to learn. 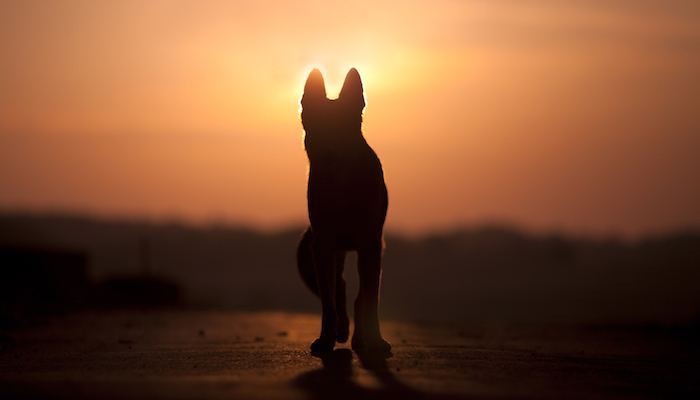 For more tips on how to cope with the loss of a pet, see this study. Dimensions- L 8-10" x W 6-9" x H 3-4" Weight 8-12 lbs.